Granted that most of us in the developed world eat for many reasons – few of which are hunger and the necessity of refuelling with nutrient-dense food – my family decided to use food as the basis of celebration and remembrance today. My nephew came up with the idea of a ‘grandpa’ foods day, as today is the third anniversary of my dad’s death. I suspect that the motivation behind ‘grandpa’ foods day may have been the idea that it was a licence to eat Dairy Milk chocolate all day. My nephew is eight after all. Nonetheless, a meal which showcased all of my dad’s favourite foods was greeted enthusiastically by everyone, including those of us considerably longer in the tooth than eight years old. Prawns in Marie Rose Sauce served in Avocado Halves. There are those who mock this retro classic. At their peril. Lemon Cheesecake, Coffee and Walnut Cake, Dairy Milk Fruit and Nut and a Tin of Quality Street. (If this tin had been comprised entirely of the fudge, caramel and toffee options, it would have been Pops Perfect). 1tsp instant coffee, dissolved in 2tbsp boiling water and allowed to cool. 1 x 20cm loose-bottomed square cake tin, greased and lined with baking parchment. Pre-heat the oven to 180°C. Cream the margarine and sugar together with an electric hand mixer for five minutes. Add a tbsp of the flour and add the eggs, one at a time, beating well after each addition. You can add in one or two extra tbsps of flour to make this easier. Add the vanilla extract, the cooled coffee and the flour and mix well to combine. Add the finely chopped walnuts and mix with a wooden spoon until distributed equally throughout. Spoon into the prepared tin and cook in the oven for 40-45 minutes (if you insert a skewer into the cake, it should come out clean). Leave to cool in the tin for five minutes, until turning out onto a wire rack and leaving to cool thoroughly. For the icing, cream together the butter, cream cheese and icing sugar for five minutes and then add the cooled coffee mixture. Chill in the fridge for 30 minutes. 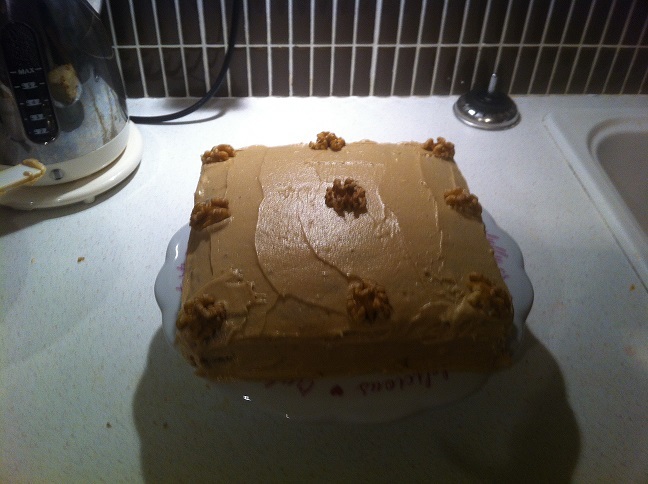 Ice the sides and top of the cake and decorate with the walnut halves. Serves 12-14. *I know, I know – purists would favour unsalted butter (preferably organic, preferably from grass-fed animals) but Stork is the baker’s secret. Light cakes every time! Don’t you reckon?